Protologue: Sp. pl. 1: 301 (1753). 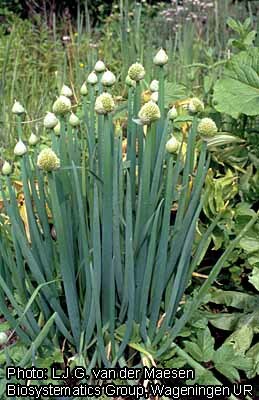 Welsh onion, Japanese bunching onion (En). Perennial glabrous herb, growing in tufts, usually grown as an annual or biennial plant, up to 50(–100) cm tall, with indistinct, ovoid to oblongoid bulb up to 10 cm long, lateral bulbs few to several or virtually absent; tunic white to pale reddish brown. Leaves 4–12, distichously alternate, glaucous, with tubular sheath; blade cylindrical, hollow, 10–50(–100) cm × 0.5–2.5 cm, acute at apex. Inflorescence a spherical umbel 3–7 cm in diameter, on a long, erect, terete, hollow scape up to 50(–100) cm long and up to 2.5 cm in diameter; umbel composed either of flowers or of bulbils only; spathe 1, hyaline, persistent, up to 1 cm long, splitting into (1–)2–3 parts. Flowers bisexual, narrowly campanulate to urceolate; pedicel slender, up to 3 cm long; tepals 6, in 2 whorls, free, ovate-oblong to oblong-lanceolate, 6–10 mm long, white with greenish midvein; stamens 6, exceeding tepals, connate at base and adnate to tepals; ovary superior, 3-celled, style slender, exceeding tepals. Fruit a globular capsule c. 5 mm in diameter, splitting loculicidally, few-seeded. Seeds 3–4 mm × 2–2.5 mm, black. de Wilde-Duyfjes, B.E.E., 1976. A revision of the genus Allium L. (Liliaceae) in Africa. Mededelingen Landbouwhogeschool Wageningen 76–11. Wageningen, Netherlands. 239 pp. Helm, J., 1956. Die zu Würz- und Speisezwecken kultivierten Arten der Gattung Allium L. Kulturpflanze 4: 130–180. Inden, H. & Asahira, T., 1990. Japanese bunching onion (Allium fistulosum L.). In: Brewster, J.L. & Rabinowitch, H.D. (Editors). Onions and allied crops. Volume 3. CRC Press, Boca Raton, Florida, United States. pp. 159–178. Krug, H., Berg, E., Crüger, G. & Fölster, E., 1991. Gemüseproduktion: ein Lehr- und Nachschlagewerk für Studium und Praxis. 2nd edition. Verlag Paul Parey, Berlin, Germany. 541 pp. Moore Jr, H.E., 1955. Cultivated Alliums. Baileya 3: 156–167. Oyen, L.P.A. & Soenoeadji, 1993. Allium fistulosum L. In: Siemonsma, J.S. & Kasem Piluek (Editors). Plant Resources of South-East Asia No 8. Vegetables. Pudoc Scientific Publishers, Wageningen, Netherlands. pp. 73–77. Shinohara, S., 1980. Guidebook for development of vegetable horticulture with capable seed production in the monsoon subtropics. Shinohara's Authorized Agricultural Consulting Engineer Office, Tokyo, Japan. 218 pp. Takamatsu, E., 1989. 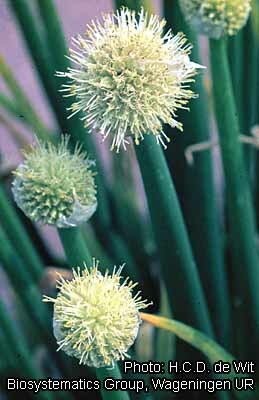 Leaf onion, Allium fistulosum. In: Shinohara, S. (Editor): Vegetable seed production technology of Japan. Volume 2. Shinohara's Authorized Agricultural Consulting Engineer Office, Tokyo, Japan. pp. 260–287. Arifin, N.S., Ozaki, Y. & Okubo, H., 2000. Genetic diversity in Indonesian shallot (Allium cepa var. ascalonicum) and Allium × wakegi revealed by RADP markers and origin of A. × wakegi identified by RFLP analyses of amplified chloroplast genes. Euphytica 111: 23–31. Chen, J.H., Tsai, S.J. & Chen, H.I., 1999. Welsh onion (Allium fistulosum L.) extracts alter vascular responses in rat aortae. Journal of Cardiovascular Pharmacology 33(4): 515–520. Diekman, M. (Editor), 1997. FAO/IPGRI Technical guidelines for the safe movement of germplasm. No 18. Allium spp. Food and Agriculture Organization (FAO) and International Plant Genetic Resources Institute (IPGRI), Rome, Italy. 60 pp. Friesen, N., Pollner, S., Bachmann, K. & Blattner, F.R., 1999. RAPDs and noncoding chloroplast DNA reveal a single origin of the cultivated Allium fistulosum from A. altaicum (Alliaceae). American Journal of Botany 86: 554–562. Galván, G.A., Wietsma, W.A., Putrasemedja, S., Permadi, A.H. & Kik, C., 1997. Screening for resistance to anthracnose (Colletotrichum gloeosporioides Penz.) in Allium cepa and its wild relatives. Euphytica 95: 173–178. Hetterscheid, W.L.A., van Ettekoven, C., van den Berg, R.G. & Brandenburg, W.A., 1999. Cultonomy in statutory registration exemplified by Allium L. crops. Plant Varieties and Seeds 12: 149–160. Pino, J.A., Rosado, A. & Fuentes, V., 2000. Volatile flavor compounds from Allium fistulosum L. Journal of Essential Oil Research 12: 553–555. Tawaraya, K., Tokairin, K. & Wagatsuma, T., 2001. Dependence of Allium fistulosum cultivars on the arbuscular mycorrhyzal fungus, Glomus fasciculatum. Applied Soil Ecology 17(2): 119–124. Yamasaki, A., Miura, H. & Tanaka, K., 2000. Effect of photoperiods before, during and after vernalization on flower initiation and development and its varietal difference in Japanese bunching onion (Allium fistulosum L.). Journal of Horticultural Science and Biotechnology 75: 645–650. Yamasaki, A., Tanaka, K., Yoshida, M. & Miura, H., 2000. Effects of day and night temperatures on flower-bud formation and bolting of Japanese bunching onion (Allium fistulosum L.). Journal of the Japanese Society of Horticultural Science 69: 40–46. Oyen, L.P.A. & Messiaen, C.-M., 2004. Allium fistulosum L. [Internet] Record from PROTA4U. Grubben, G.J.H. & Denton, O.A. (Editors). PROTA (Plant Resources of Tropical Africa / Ressources végétales de l’Afrique tropicale), Wageningen, Netherlands. <http://www.prota4u.org/search.asp>. This page was last modified on 29 April 2018, at 17:50.